Did The Burger Stall Owner Chase The Rapid KL Bus Driver With A "Samurai Sword"? That's what he is being accused of by a Facebook comment being circulated around. "I noticed people have taken to social media, alleging that we used sticks and samurai swords to attack the bus driver. But the truth is, we did no such thing. We did not chase him with a samurai sword." These are the words of Azri Arip, the owner of the burger stall that was damaged in the Thursday night accident along Jalan Enggang near the PKNS flats in Taman Keramat. The accident was caused by a Rapid KL bus that was being driven by a 32-year-old driver whose urine test has revealed that he was under the influence of drugs. The 22-year-old owner of the burger stall has been accused on social media by someone who claims to be an eyewitness that he along with a group of men chased the bus driver armed with wooden sticks and samurai swords, making the driver panic. Well, actually the "eyewitness" is a Facebook comment that is being circulated around by several individuals, with a disclaimer that it is a "copy-paste" post. However, there is no reference to the original poster. SAYS couldn't find any post that seemed to have been the origin of the allegation that "samurai swords" were used. One such "copy-paste" post that is being cited by local media, including NST Online in its report on the incident, is by a page called "Malaysia30". "There were members of the group who were armed with wooden sticks and samurai swords during the assault. The clip (recorded by the burger stall owner) was only half (of what had happened during the alleged assault). "The bus driver was severely injured when the ambulance arrived at the scene," reads the "copy-paste" post, which accused Azri of going "overboard" especially considering that his burger stall was not badly damaged and no one was injured. According to the Facebook comment, the Rapid KL bus driver had actually swerved near the burger stall to avoid hitting a motorcycle but in trying to evade a collision with the motorcycle, the bus grazed the corner of the roadside burger stall. "The bus driver had stopped at the scene (and alighted the bus) to check on the damage to the stall as well as the condition of the woman and the infant. "However, he then noticed that the stall operator and a group of men from a nearby flat were charging towards him. The driver immediately fled the scene," as per the Facebook comment copy-pasted by the "Malaysia30" page. "It is clear in the video recorded by the stall owner that the bus driver was in a state of panic, (which is why he drove) his vehicle in a dangerous manner." It even claimed that the doctor treating the driver has "confirmed" that he has "50/50" chance and is now in a "red zone" of Ampang hospital. Rumours also spread that the 32-year-old driver died after succumbing to his injuries. On the contrary, the driver is well and alive, reported The Star Online. According to a report in The Star Online, Azri claims that some RapidKL bus drivers' group wanted to "confront him at his burger stall and cause trouble." "I noticed people have taken to social media, alleging that we used sticks and samurai swords to attack the driver. These are absolutely fake. We did not have any weapons on us," he said, adding that he also did not galvanise a whole angry village to take revenge on the driver as being alleged by some social media users. "I did no such thing, if the bus driver had just got down after the initial collision, things would not have become so bad. "Even after he rammed into all those vehicles at the end, he still tried to run away," Azri was quoted as saying by The Star Online, adding that he hoped justice would prevail. Azri said he had just returned from work when he heard a loud bang. 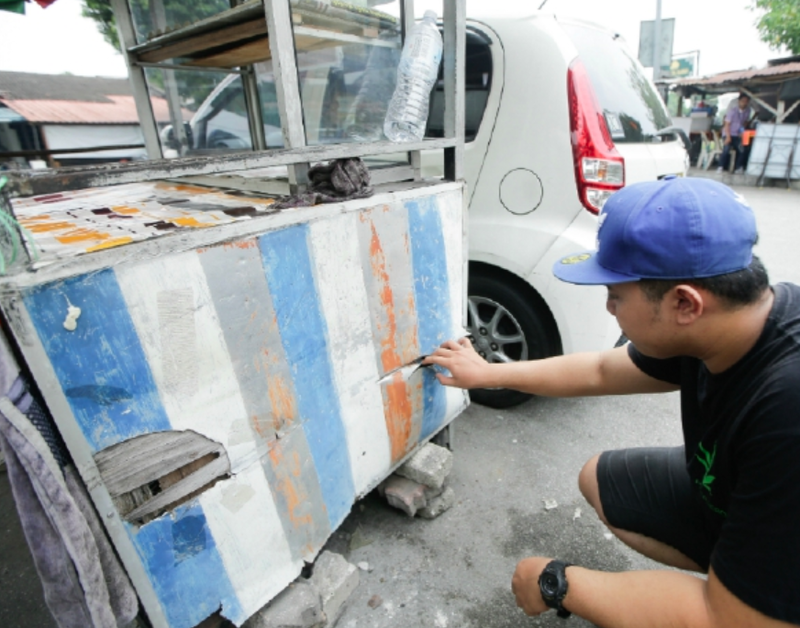 "I rushed outside and saw a Proton Iswara next to my burger stall after it was hit by a bus. 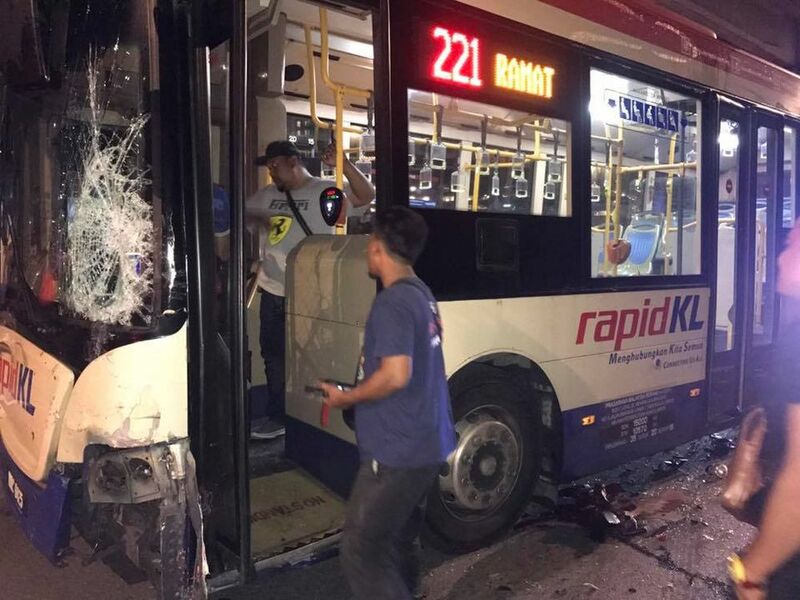 Tables were strewn all over the place and my mother who was carrying my two-month-old nephew at the time of the incident was wedged between the stall and road divider," the 22-year-old owner of the burger stall told NST Online, adding that the Proton Iswara was turning into the area when the Rapid KL bus hit it. According to Azri, the driver of the Proton Iswara first gave chase to the bus. While the bus driver stopped the vehicle, he allegedly asked all passengers to leave the bus after which the bus driver sped away. "Four of us chased the bus on two bikes. I was angry because the driver left the scene of the accident when we could have settled this matter at the location. 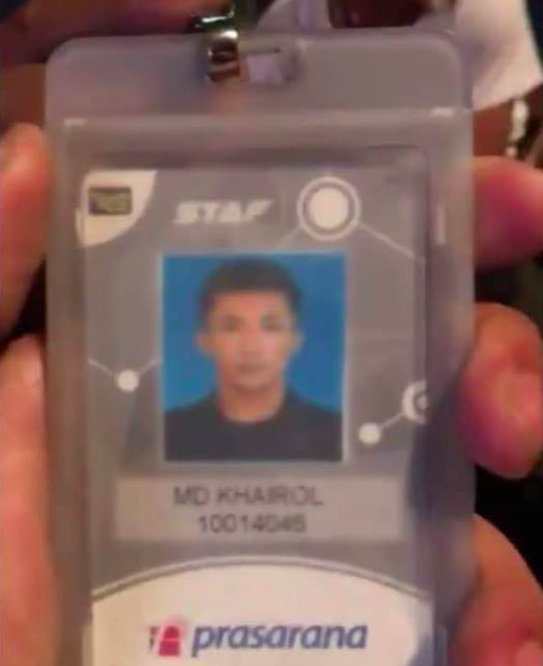 "When we were chasing him, he put his hand out the window and showed a sign challenging us to keep chasing him," Azri was quoted as saying by NST Online. Meanwhile, after receiving threats, Azri has lodged a report at the Hulu Kelang police station. The Star Online reported him saying that it was as a precautionary measure. The bus hit a total of seven cars during the incident. The horrific incident occurred near MRR2. He tested positive for methamphetamines.